You may not be aware, but everyday everyone receives a certain dose of radiation. This is called environmental background radiation. It comes from the sun or any electrical device around us. Some people, depending on their job and where they live, receive more or less background radiation. When talking about radiation, everyone's fear is what effect it can have on our body. I am talking mainly about cancer. Of course, the more cells subjected to radiation, the more they may mutate and start multiplying without control, creating a cancer. So, when x-rays or scan radiation is mentioned, it naturally makes us concerned about the risk of cancer. As the fear and correlation is real between radiation and cancer, we have to do everything in our power to reduce the radiation we receive each day, knowing that no mater what we do, we will be subject to a certain dose of background radiation. When visiting the dentist and deciding to have dental x-rays, panoramic x-rays, or CT Scans, it is always important to evaluate the benefits versus the risks. For example, is the risk of letting decay grow and involve the nerve causing an abscess worth the risk involved with taking a couple of dental x-rays every two years? 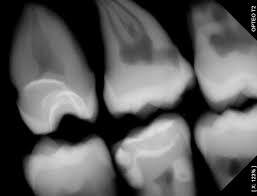 It is suggested that patients have a full series of intra-oral x-rays (16 to 18) every two years. This number of x-rays corresponds to an average of 7 days of general background radiation. In comparison, a body scan of the abdomen corresponds to 240 days of background radiation. If you consider the fact that dental radiation are now digital in many offices, which reduces the radiation effect by 90%, and the fact that x-rays are very localized to a non-growing area (your jaw) and with the use of a body apron for protection, the real risk of having x-rays every two years or a panorama or CT Scan is very minimal. Dr. Lemay offers a range of treatments to restore the health and beauty of your smile. If you would like to learn more about your treatment options, we welcome you to schedule a consultation.